When Fortune 500 companies were asked to name the top law firms they turn to when litigation arises, Bonner Kiernan Trebach & Crociata LLP was on their list. 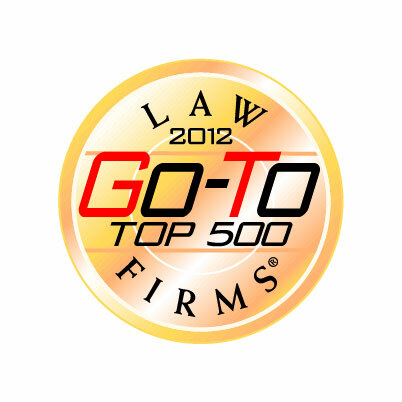 Bonner Kiernan is pleased to announce that it has been named as a 2012 “Go-To Law Firm”® in Litigation and will be featured in an upcoming issue of American Lawyer Magazine and the 9th Annual “In-House Law Departments at the Top 500 Companies,” a guide produced by the publishers of Corporate Counsel Magazine. ALM Media conducts annual surveys each year among Fortune 500® General Counsel and other company leaders, who utilize this guide as a primary source for identifying choice law firms selected by their colleagues and to survey the firms and their key attorneys, as well as to network and consult with others in their industry. At Bonner Kiernan we commit our talents and energy to a practice devoted to defense litigation, and to counseling the Firm’s clients on issues which affect their potential for litigation. We represent clients on a national basis, and maintain offices in eight states, plus the District of Columbia. Our lawyers have appeared in the courts of over 35 states and territories.